SORRENTO has earned their way through to the MPNFL Division One Grand Final with a win over Mt Eliza at Frankston Park. The game got off to a great start for Sorrento, as Shannon Gladman opened the scoring with an impressive banana kick. Mt Eliza quickly replied though, as last weeks seven goal superstar Jordan Moncrieff snagged an early goal. 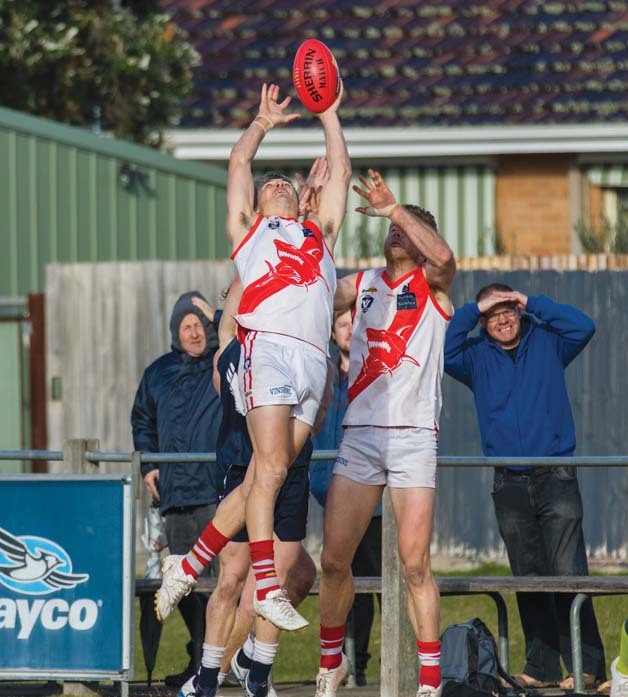 Mt Eliza went behind early but fought back in the second term, as an unlikely bounce saw the ball fall into the lap of Moncrieff, who put the Redlegs within two points. The Sharks soon fell behind, and went into the half time break behind by seven points. In the second half, Sorrento looked sharp and brought the game back on level terms thanks to a monster effort from skipper James Hallahan. Leigh Poholke put the Sharks ahead and suddenly it was the Redlegs on the ropes. A five goals to none third term had the Redlegs hurting, but it wasn’t all good news for the Sharks though, as Chris Dawes went off the ground with an injured leg, putting his finals campaign in jeopardy. The Sharks were too good for the Redlegs in the end, as the loss brought an end to Mt Eliza’s season and Troy Shannon’s tenure as coach. Sorrento won the match 12.12 (84) to 9.9 (63) and will play Pines at Frankston Park on Sunday.